BACKGROUND: We had previously eaten at Yak & Yeti only once, and that was more than 4 years ago (so not long after the restaurant opened). Although we enjoyed our meal, we just never got around to returning for another. On our next family trip in March 2010 we ended up trying the Yak & Yeti counter service for lunch, which was also good. As for the next two trips, I’m ashamed to admit this but we didn’t even go to Animal Kingdom. I know, I know…I’m sure all of you AK fans are looking at the screen right now in total disbelief. You will be happy to know though that I was immediately and quite thoroughly punished for this offense upon my return to Animal Kingdom last November. My son loves AK (mostly due to the Expedition Everest ride) so insisted that we go there for at least part of a day during our short trip. Upon entering the park, we made a beeline to Expedition Everest and my son made me ride it with him four times in a row…with no time in between to allow his poor mother’s brains to unscramble. And yes, the crowds were so light that Thursday morning in mid-November that EE was a walk-on…over and over again. Now don’t get me wrong, I like this ride but four times in a row are at least two times too many for me. 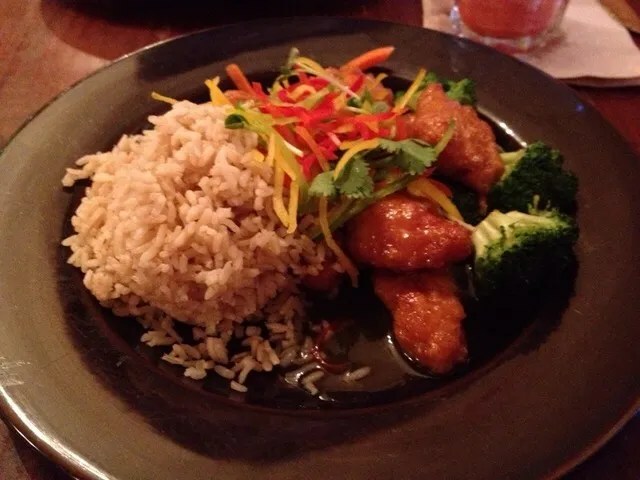 Anyway, I had suggested that we have lunch at Y & Y during that visit to AK, but my son had his heart set on eating at Flame Tree Barbecue so that is where we ate (well, actually I waited to have my lunch at the F & W Festival ). So anyway, for the record, this decision did not work out so well for my son, as he ended up having to pitch most of his lunch into the nearest garbage. (Sorry all you Flame Tree lovers, but his ribs that day were dry, burnt, and just plain old nasty. ) When, oh when will he ever learn that his mother always knows best??? Following our day of GLUTTONY, I was feeling a little guilty and decided to skip breakfast (well, except for my mandatory cup of coffee, of course). Also I should tell you that we split up today, with Allison heading to Epcot with a friend who was visiting for the day, while Emily and I were off to Animal Kingdom. Arriving around 10:30, we only had time to ride Expedition Everest once through the stand-by line (much to my relief) and obtain Fast Passes for later, before it was time for us to check-in for our 11:30 lunch at Yak & Yeti. Entering their lobby, we joined the line that had formed of guests waiting to be seated when the restaurant opened. I wasn’t aware of it then, but another disboard member (vettegirl) was probably in that line of people in front of us, as she too ate at Y & Y at 11:30 on this day. From reading the review of her lunch, she and her DH were seated upstairs, while Emily and I were at a table downstairs, right by the bottom of the staircase. And speaking of vettegirl’s review, she did an excellent job and even remembered to take a picture of the menu. Since I failed on this aspect of my dining review, here is the link to hers so that you can see what was on our menus that day. Not wanting me to drink alone, Emily ordered a frozen Strawberry Daquiri. 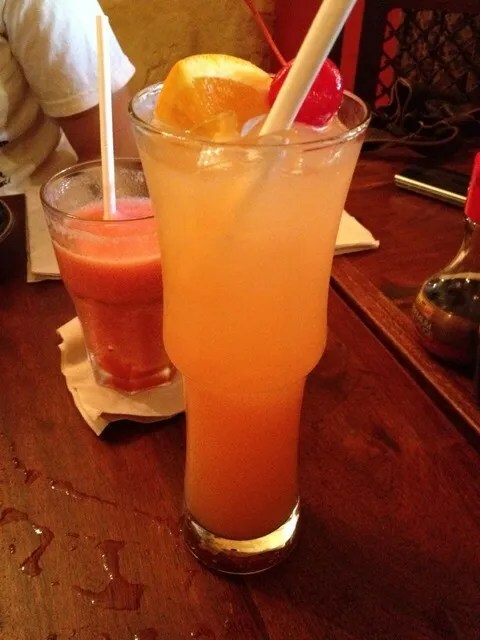 Just kidding… make that a Virgin Strawberry Daquiri, as she is only 19. Both of these drinks received a rating of “Very Good”. But Emily wanted me to add that if her Daquiri had included some rum, she probably would have rated it as “Excellent”. Okay, now on to the food. Emily and I had a difficult time choosing an appetizer to share, as she really wanted the Pot Stickers and I wanted the Egg Rolls. So which did we end up ordering? Yep, we got both of course! 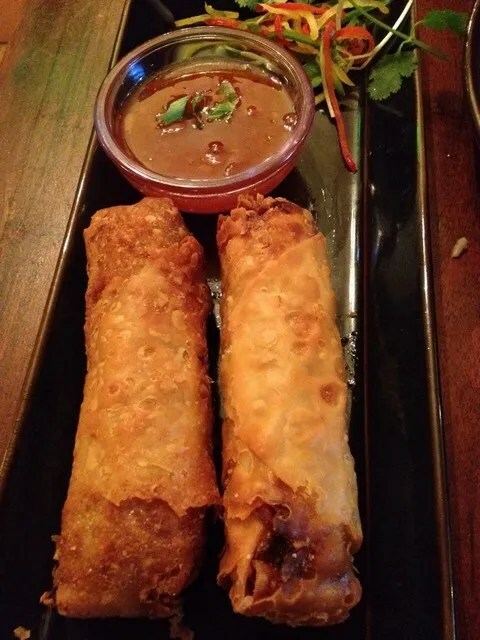 But hey, at least we ordered the “Sides” portion of two egg rolls instead of the “Appetizer” portion of three. Anyway, Emily loved the Pot Stickers and gave them an “Excellent” rating, but the Egg Rolls received only a “Good” from her. I’m not crazy about pot stickers generally, but as far as pot stickers go I thought these were “Good”. I much preferred the Egg Rolls and gave them a better rating of “Very Good”. 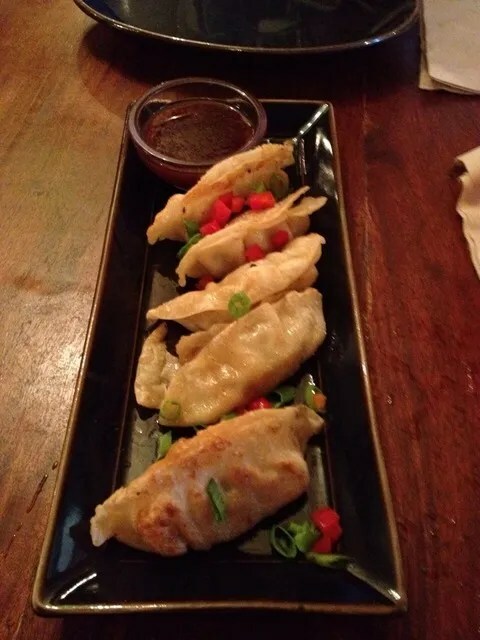 So averaging our scores, the Pot Stickers received an overall rating of “Very Good”. I’m also giving the Egg Rolls a “Very Good” because…well, just because I can since I’m the writer of this report. 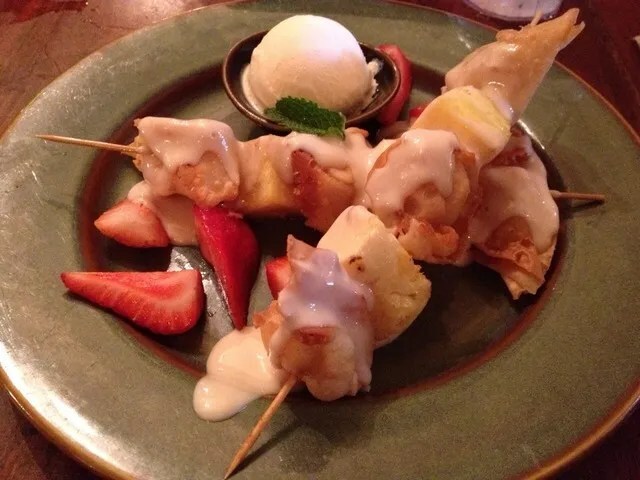 Fried Wontons Dessert – Skewers of fresh pineapple & fried cream cheese-filled wontons and sliced strawberries, all topped with a honey-vanilla sauce. Also served with a small dish of vanilla ice cream. You see, although I had drooled over countless pictures of this very popular dessert, I was one of the few disboard members who had never tried this. I now finally had the opportunity to rectify my unfortunate situation. So was I disappointed? No, I was not. I’m happy to report that this dessert does in fact taste as good as it looks in all the pictures. (Well, except for Linda67’s that is, as she was apparently served stone-cold wontons during her last visit to Yak & Yeti. ) Were the Fried Wontons good enough to make my list of favorite Disney desserts? No, but they were pretty darn good…actually “Very Good” and that is the rating that both Emily and I gave to the Yak & Yeti Fried Wontons dessert. As a side note, I had the picture of the wontons pulled up on my laptop as I was working on my review. My son noticed it and commented on how good they looked, as he loves all the components of this dessert. When I told him that they were from Yak & Yeti, he immediately started complaining that I hadn’t taken him there on our trip in November. The complaining stopped pretty quickly though when I reminded him that I wanted to go to Yak & Yeti but he insisted that we have lunch at Flame Tree Barbecue. His response, “Oh, yeah, I guess I really messed up, didn’t I?” And so I have a very good feeling that on our next visit to Animal Kingdom, we will be dining at Yak & Yeti.